Hans Bellmer is internationally recognised for his fragmented and doubled dolls (poupées) that were initially created as forms to manipulate and photograph. Inspired by Max Reinhardt’s production of Jacques Offenbach’s ‘Tales of Hoffmann’ which featured the tale of ‘The sandman’ who fell in love with the life-sized doll Olympia, Bellmer constructed his first doll in 1933, the year Hitler rose to power. 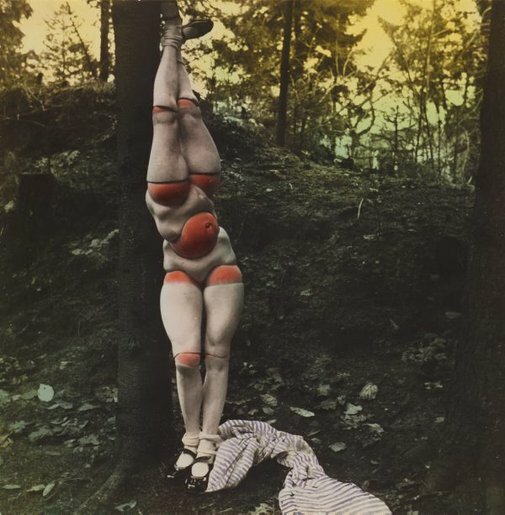 The following year Bellmer sent his photographs to the surrealist André Breton, of which 18 were immediately published in the journal ‘Minotaure’. The group, who saw the work as conveying an irreducible perversity, received the photographs of the fragmented and uncanny doll with great enthusiasm as reflecting the avant-garde’s interest in mannequins and Breton’s notion of convulsive beauty. He created the second, more advanced doll in 1935 to include various body parts that could fit around a universal ball joint providing for full articulation. ‘La poupée’ shows the second doll with four legs and two pelvises joined to the bulbous stomach joint, visually doubling the figure, adding to its uncanny appearance. The sexual allusion is highly charged with the figure leaning provocatively by a tree with any covering it may have had now lying at its feet. Another version of this photograph shows a man hiding behind a tree as if complicit in some perverse act. This image is unusual in that it is one of few taken outside the safety of Bellmer’s own apartment and reflects his new, but short-lived artistic freedom, having escaped Germany in 1938 for Paris after being declared a degenerate by the Nazis. The poupée is often posed in strange contorted positions, sometimes partly dressed and at other times with a hair bow, but always with the defining Mary-Jane school shoes. Donna Brett, Photography: Art Gallery of New South Wales Collection , 'The surreal aesthetic', pg.113-129, Sydney, 2007, 112 (colour illus. ), 114, 124 (colour illus.). Natasha Bullock, Look , 'Perverse puppet: Surrealism turns a doll into a symbol of bizarre eroticism', Sydney, Jun 2002, 20 (colour illus.). Lisa Le Feuvre, Tate etc. , 'Extending bodies', pg 60-67, London, 2016, 62 (colour illus). Hans Bellmer, photographe , Paris, 1983, 85 (colour illus. ).